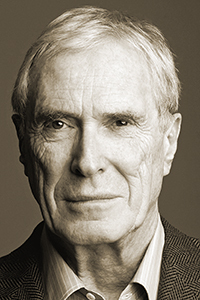 Mark Strand received a BA from Antioch College and a BFA in painting from Yale University. His artwork has been included in both Josef Albers’s Interaction of Color (Yale University Press, 1975) and Bernard Chaet's The Art of Drawing (Cengage Learning, 1983). Strand has written three volumes of art criticism: Edward Hopper (Ecco Press, 1994; Knopf, 2001), William Bailey (Abrams, 1987), and Art of the Real: Nine American Figurative Painters (Clarkson Potter, 1983). His books of poetry include New Selected Poems (Alfred A. Knopf, 2007), Man and Camel (2006), Blizzard of One (1998), which won the 1999 Pulitzer Prize in Poetry; Dark Harbor (1993), The Continuous Life (1990), Selected Poems (Atheneum, 1980), The Late Hour (1978), The Story of Our Lives (1973), which won the Edgar Allan Poe Award from the Academy of American Poets; Darker (1970), Reasons for Moving (1968), and Sleeping with One Eye Open (Stone Wall Press, 1964). His most recent book is Almost Invisible (Alfred A. Knopf, 2012), a collection of short prose pieces. He is the recipient of fellowships and grants from the MacArthur Foundation, the National Endowment for the Arts, the Academy of American Poets, the Ingram Merrill Foundation, the Rockefeller Foundation, and the John Simon Guggenheim Memorial Foundation. He is a member of the National Institute of Arts and Sciences and the American Academy of Arts and Letters. Strand served as Poet Laureate Consultant in Poetry to the Library of Congress in 1990, and is the recipient of the 2004 Wallace Stevens Award from the Academy of American Poets and the 2009 Gold Medal for Poetry from the American Academy of Arts and Letters.